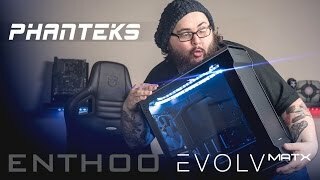 The original Evolv case marked Phanteks first foray into the Evolv line of cases, which led to the popular Evolv ITX/ATX models and the highly successful Evolv ATX Glass. This particular model in Gunmetal Grey retains most of the features found on the original Evolv, but adds a plethora of desirable features to further improve an already great case. The first and foremost is a pair of 3mm tempered glass side panels, with the right hand glass panel heavily tinted to only show any installed SSD drives. This means that cable management is hidden without losing the premium feel and look of tempered glass panels. More links for "Enthoo Evolv Micro-ATX Glass Case - Gunmetal Grey"